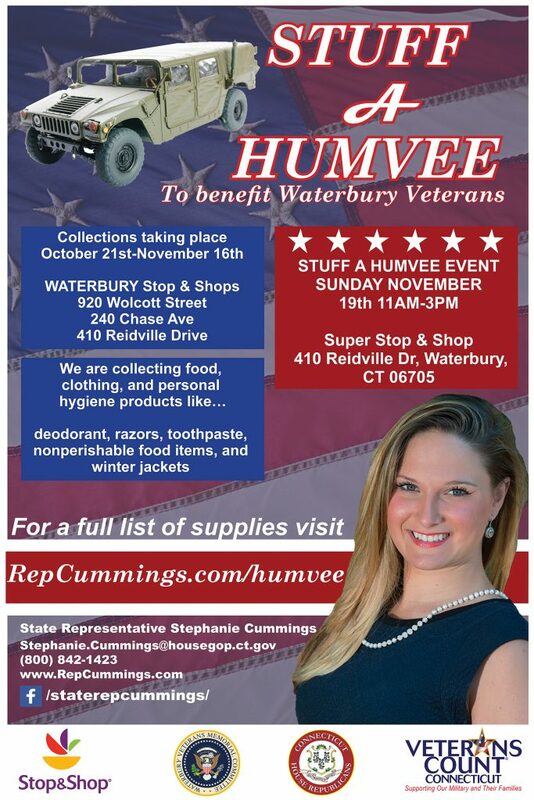 State Representative Stephanie Cummings (R-74), in conjunction with Veterans Count Connecticut, Waterbury Veteran’s Memorial Committee and Stop and Shop Supermarkets, and with assistance from the Connecticut Military Department , is hosting a “Stuff a Humvee” event to collect needed items and money to assist local veterans in need. Stop and Shop will have collection boxes at all three Waterbury locations – Waterbury Plaza, 240 Chase Ave., Naugatuck Valley Shopping Center, 920 Wolcott St., and 410 Reidville Drive from October 21 through November 16. The Stuff a Humvee event will take place on November 19th from 11 a.m. to 3 p.m. in the parking lot of the Super Stop & Shop located at 410 Reidville Dr., Waterbury. When: Sunday, November 19th from 11 a.m. – 3 p.m. The post Stuff a Humvee to Help Local Veterans appeared first on State Representative Stephanie Cummings.